Stroll along quaint streets of the French Quarter to Jackson Square on the Mighty Mississippi. Explore the French Market while your guide shares stories about New Orleans' oldest neighborhood. Let your own ‘local expert’ unravel the mysteries of one of America’s oldest and most unique living neighborhoods! 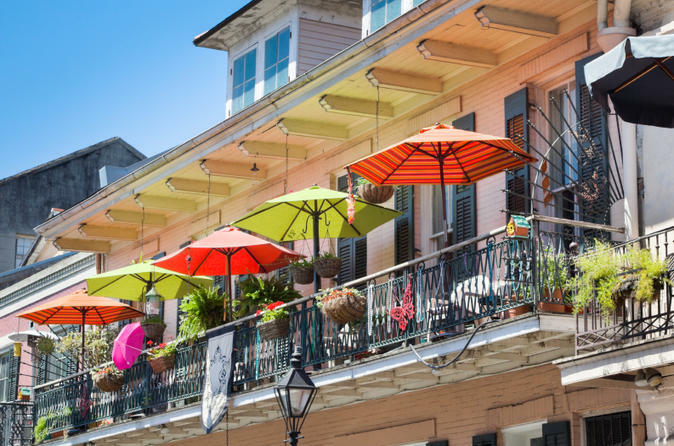 Follow in the footsteps of historic figures as you stroll along the Mighty Mississippi, through the French Market and Jackson Square, and down the banquettes (sidewalks) of quaint streets named for saints and sinners from our European past. Learn about the Creoles on this tour through the original city, founded in 1718 by French explorer Jean-Baptiste Le Moyne, Sieur de Bienville. See the old Quarter come to life as your guide explains its secrets and helps you understand all it has to offer - architecture, courtyards, gardens, food, music, and art. Visit Madame John’s Legacy, built in 1788 and one of the best examples of French colonial architecture in North America. We’ll take a break at Lafitte's Blacksmith Shop, built between 1722 and 1732 and reputed to be the oldest structure used as a bar in the United States. The property is believed to have been used by the Lafitte Brothers, Jean and Pierre, as a New Orleans base for their Barataria smuggling operation. Your tour ends at the Cabildo, built under Spanish rule in 1795-1799, and the site of the Louisiana Purchase in 1803. Featuring a comprehensive exhibit on Louisiana's early history, the Cabildo served as a city hall, a courthouse and a prison. It was the headquarters of the Louisiana State Supreme Court for the landmark Plessy vs. Ferguson decision. One of the most legendary artifacts on display here is the death mask of the French Emperor Napoleon Bonaparte. Some of his former officers schemed to rescue him from exile on the island of St. Helena and bring him to Louisiana but he died a few days before this plan was finalized. Special Offer - Book and travel by September 10, 2018 and save 7% off our previously offered price! - Book Now!